Today, Omni-channel is so much broader than just the technology platform the customer uses for purchases—web, store, mobile, catalogue and so on. At its heart it is really about fulfillment—the customer’s choice of fulfillment. Omni is complex and the drive to adopt it is a difficult and expensive road for those retailers who didn’t think through the complexity of the processes and data a long, long time ago. In addition, organizations that have had a lot of change such as mergers and acquisitions (and have multiple systems that just don’t talk to each other) have variable capability to identify ‘the customer,’ as well as difficulty seeing across their operations to complete transactions. Brands and retailers who considered and managed their channels uniquely are struggling to cope with the rapidly changing retail landscape. Retail is a sector that has been underinvested in, in terms of strong back-end systems, with most of the money having gone into point of sale. New concepts were ‘tack-ons,’ rather than being part of a fully integrated strategy. Those who did see web, catalogue, and store as the same buyer and the same merchandise, and the warehouse shelf and store shelf as just another shelf are in better shape as shoppers shift their channels. We interviewed retailers across the world to understand their Omni-channel initiative, learn what they are doing to achieve an Omni-channel, and determine exactly what Omni-channel means for them. In interviewing many retailers around the world, we learned that different geographies, cultures and customs, and the demographics of consumers significantly impact the methods retailers are adopting as they develop their Omni-channel framework. We will point out these differences as we go. However, there were also a lot of common challenges. These interviews took us from New Orleans to New Zealand, from Korea to the Reykjavík, from Butte, Montana to Belgium, from LA to London. Types of retailers ranged from general merchandise department stores, outdoors/sporting good, to apparel and shoes. Some are brand companies who have journeyed into retail, first leveraging their brand in outlet malls and now venturing into first lines and flagship retail stores. We are sharing key lessons we learned from them. First we will look at the capabilities and technologies being adopted. Then we will look at the nuances—concept and culture—to see how retailers maintain their identity and relationships with their customers. One of the main areas of change involves rethinking the merchandise strategy. This has two key elements: selection and allocations. The web has given companies a great way to evaluate customer interest in products with analytics that can evaluate dwell times during searches across chains and so on. However, let’s not forget the stores! As one retailer told us, not only can we see the interest and, of course, purchasing trends, but also gauge the source, such as social or web promotions. But we don’t understand the dynamics in the store. Retailers have generally failed, except in the high end lines or specialty merchandise categories (and we will come back to those shortly), to gain employee feedback about customer interests, needs, and inventory shortages. Especially in large general merchandise settings, staffing is often so sparse that the sales staff is unaware of customer interests. What to do? Retailers, as a prerequisite, are implementing the foundational systems to evaluate merchandise—with merchandise planning, style/size/assortment analytics.1 (The foundational data model is needed for what is to come.) Pilot stores, especially in the EU and Asia (Japan and Korea), are using a combination of video, RFID,2 and sometimes the magic mirrors. These allow shoppers to learn about products, but also alert sales staff that customers are interested in a product or may need some help. Many of these systems have a digital data trail so retailers can gauge whether interest translates into sales. For example, with RFID and smart shelves, they can see how many times a product was picked up or sense shuffling through the display (e.g., picking up and dropping a lot of products looking for a size) vs. sales from POS. Brands and retailers are looking for data as soon as possible about the interest in their products. “It’s way too late,” one retailer told us, “at the end of a season after you have put all your money into a collection, to see if it sells. We want to know at the earliest possible moment so we can take some kind of action.” So store data have to feed the merchandise system (Merchandise Financial Planning and Assortments). That might include traditional approaches like promotions, but advanced retailers are taking a more proactive—predictive—approach. One international shoe company I met at Logility’s user conference told me that they don’t build the whole forecasted season any more. Having better merchandise analytics allows them to have a more responsive strategy toward international markets with less inventory risk. They build half, see what’s hot/what’s not, and then build the rest. Retailers who don’t control the supply chain so adeptly need other approaches. Making smarter allocations seems to be one such approach. Allocations are a hot topic in retail today. I spoke to several retailers in person and for this Omni research about the importance of banning spreadsheets and making allocations smarter, automated, integrated, and more dynamic. Rather than pushing the whole collection into the stores, retailers can use a more dynamic approach and look at demand across their retailers’ shelves (in the store or warehouse). Delaying the full shipment allows them to assess the real point of sale: for example, a web sale can be shipped from the DC, rather than first to the store and then to a customer. Or if one store or territory is selling more of a product, they can ship to that store from the DC, avoiding transshipments. Kathmandu uses a store grade system (different square footage and formats), so allocating cannot be the same per store. Hence, not only does merchandise choice vary by location, but also quantity. Slightly lower stock allows for an improved working capital position, as well as, they said, “…improves the store space presentation.” To do this, of course, you have to have a just-in-time approach to replenishment strategy. Kathmandu ships internationally and is expanding their presence in other regions around the world. And Nicolson told me that they are learning about their international customers and merchandise choices. Expansion can be quite challenging, but the foundation Kathmandu has put in place gives them a methodology that can scale for these types of expansions. Many a retailer falters in the excitement to open in a new market, only to close these stores later on, which takes a huge toll on cash—and reputation. Investors don’t like to see store closings. Here is a key to all Omni success: Where in the world is that item? You can’t sell what you can’t see. Thus having network-wide inventory visibility is a must.3 Accurate inventory systems are the very foundation of the supply network. Retailers have used a variety of methods to achieve this, from brute force—frequently cycle counting—to barcoding to RFID. Inventory visibility allows for any of the ways you want fulfillment such as ‘hold at store,’ ship from store, ship from local DC, to drop ship options. An interesting note here is that we often say that RFID is a challenge to implement in stores due to the sales staff’s reluctance to change. Actually, Hübert said that their store personnel readily accepted it. They are a young group who readily embrace technology, but especially so, since this has made it easier to locate inventory, keep inventory stocking levels accurate, and so on. This is critical for ship from store, as I learned from Hübert. Moods is now shipping about 25% of their online orders from the stores. Another powerful example is JBC of Belgium. Fred Tielens, Logistics Manager at JBC, stated, “We partnered with Checkpoint to prove the concept and measure the impact RFID technology would have through our supply chain. We can now accurately track and have visibility into the quantity and location of over 17 million stock items, which enables us to confidently expand our omni-channel initiatives in the future.” Inventory visibility enables JBC’s online shoppers to see an accurate inventory quantity of its merchandise. Another interesting retailer is Massey’s Professional Outfitters. I spoke to Gerry Fullington, the General Manager for Massey’s stores, who has made some significant changes in the business strategy during the last few years, including increasing investment in stores (we discuss this in the Culture section below), and better collaboration with the big brand suppliers they carry. They call themselves a hybrid—both brick and web. They developed a process with their suppliers, expanding their catalogue to include a rich array of supplier inventory. To achieve this, they integrated UniteU ecommerce to their Retail Pro retail management software. With the Retail Pro platform, they are able to see data for every channel—store, warehouse, or suppliers’ inventory—in one place, which is the foundation for Omni-channel. Fullington said that this connected, total view across their physical and digital channels allows them to keep lower inventory, rebalance inventory between stores, and implement drop ship rather than using their own warehouse, saving transportation dollars. This has allowed them to be a lot savvier about inventory management—what to stock and what to hold back with the supplier. Visibility allows them to offer a much richer catalogue and support regional, seasonal sales without taking a big inventory position. Retailers have had the biggest challenges with fulfillment. Previously, many retailers acted as if Supply Chain and Logistics were second-class citizens and the merchants were kings (and queens) of the realm. No more. 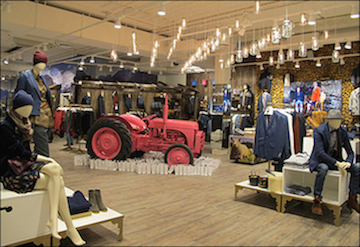 General merchandisers, well, “all they’ve got is place,” one retailer told us. “Place today has to be virtual if we are to compete, since many of our top competitors carry the same brands.” General merchandisers and big box retailers have spent billions, already, on home delivery strategies and building and modernizing the warehouses to be fulfillment centers (vs. just a pooling or flow through deconsolidation point between suppliers and the stores). That means one-each pick pack and ship. They are also leveraging stores as fulfillment centers, when realistic, since this gives them the advantage over ecommerce-only etailers when it comes to customer experience and same day/next day fulfillment options. The retailer is not the only player here, as suppliers are being drawn into the model, either by their own choice to sell direct or because they are a supplier who is fully engaged in the retailer’s model as a source for an infinite catalogue and virtual inventory and fulfillment. Fulfillment practices are diverse, quite frequently, based on corporate strategy. How is the supply network organized? Today that includes, potentially, suppliers, the retailers, DC, and the stores. Built on top of inventory visibility is a great opportunity to leverage stock availability across the supply network. Massey’s back-end structure has Omni-channel fulfillment with a vendor drop ship application.8 We are seeing more of this method being adopted, but it requires the back-end system to be smart enough to tick and tie everything before committing to the customer. That means accurate inventory (here it is again) at each node and, then, a method for determining the best place/way to ship. The integrative platform between entities that stock and fulfill is essential here. Firms like JDA, who offer distributed order management, are key players in this multi-node issue. All that aside, this is serious business. Nowhere are the customer’s expectations highest than at home expecting on time and exceptional service. Whether delivering and installing a bed or delivering fresh hot pizza, retailers have to get this right. Parcel is getting a makeover as billions—yes billions—of dollars are being poured into new warehouses from Austria to Australia. Ship from store is also a prime area of investment since shopkeepers can leverage their, often, local presence to serve customers. Home delivery is a very divergent area: vast lands with low customer density vs. metropolitan high density/high traffic challenges. Australia and the US, who have to cover vast territories, are most similar. Bon-Ton, for example, is investing hundreds of millions in a new warehouse in the mid-western US (a prime location for national fulfillment centers). Big projects with Australian retailers are also under way with mega-sortation warehouse operations to fulfill both one-each as well as cartons-to-stores. The metropolitans like John Lewis in the UK or Tesco in Korea, who are poster children9 for home delivery,10 demonstrate that home delivery can make, not lose, money. Creating choice in services—not just standard vanilla parcel services—is a prime strategy and differentiator for their companies and brands. Though high population density can mean greater sales, it has unique problems in terms of logistics. While I was talking to Gerry Fullington at Massey’s, it struck me as he talked about ‘their customer,’ that culture and custom matter. Massey’s customers want to learn all they can before acquiring a kayak, bicycle, or other equipment. Fullington said that service was really important to their customer, and that many still want to come into a store for advice. Hence, it is important for Massey’s to maintain a smart sales staff and have clever inventory management to ensure that good demonstration items are on hand when customers come in to shop. Massey’s, like many, got the e-commerce craze a few years back, but has in many ways shifted back to the stores, where customers can get services—speak to real human beings. 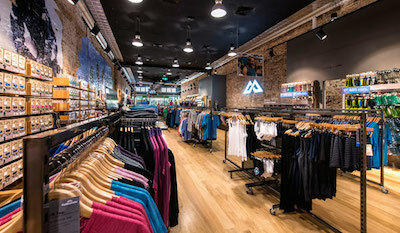 Sporting goods and outdoor goods stores like Massey’s and Kathmandu have gone all out to develop community relationships to educate customers and support local events, charities, and social—as in real, physical social groups—to foster sports activities such as fun runs, ride and climbing clubs, and so on. As another example, Kathmandu enhances their brand through fostering health and green. Going digital with shoppers seems to have taken hold outside the US, mostly emerging in Asia where technology obsessions still dominate. The demographics—those more than one billion young shoppers who have a rising income pool—support the development of new Omni-concepts. 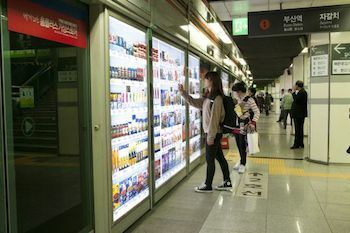 In Korea, grocery shopping in the subway using mobile devices and subway station displays with subsequent home delivery has been going on for a few years. Moods, with a focus on a younger shopper, also leverages their RFID and mobile technology in the store to create a modern customer experience. 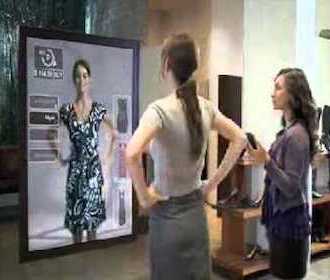 As mentioned above, technology plays well with the young shopper and the sales associates, too. Is there still a place for the traditionalist? Some of the older, but venerable, brands have been doing a lot of research into what their customers are looking for. Service. When a shopper moves from a $25 dress to a $250 or $500 (or more) dress, expectations shift. For them, Omni means consistency across channels, so precision in inventory locating, for example, is critical. If the shopper comes into the store, finding that high-end garment can be the big sale of the day. And enhanced services such as shipping that suit, once it’s tailored, to your hotel in London where you are meeting with a key client, is all in a day’s work. Their systems have to support exceptional execution. Of course, the new twist on this is the ‘e-commerce gone store’—clicks going to brick—players who have small sample only store formats. There are several retailers like this today who cater to men’s suiting, for example. A new idea? Or maybe it’s just the bespoke London or Hong Kong tailor for a new generation. Many of these traditionalists have launched outlet stores and are using the outlet as the place to experiment. They launch new lines that reflect their brand and tradition, but with an eye to attracting a new generation. This is being addressed with new merchandise lines, changes to store format, and so on. Omni is so important that many organizations have created a new position: Omni-channel VP. The Omni-executive needs to understand all the nuances of store operations, supply chain, and multi-channel selling. That’s a tall order. Often filled by a candidate who rose from the ranks of Supply Chain or an e-commerce executive (who was also running fulfillment), this position can often subsume many functions. Thus, it requires a person who has operational skills and great management skill, since they will have to collaborate with other executives and may have to ‘encroach’ on their turf to make fairly dramatic change. The Omni-channel executive is designing the new retail model for our decade. To market test some of these companies’ new Omni-strength I did some ‘research,’ by shopping and shipping items to relatives in the UK and EU as well as a few items to myself. My Moods sweater arrived in the US flawlessly. The UK packages (John Lewis, Marks and Spencer) well done! Some US retailers are exceptional. But others need a lot of work—a lot. One of my customers, a super consumer (and, in fact, an IT manager for one of the biggest online ordering systems in the world) was at a store recently (a large US chain), and when they did not have the merchandise in the store the salesperson said, “Go look it up online.” Really? Someone told the customer that? In the quest for bold new strategies we cannot forget the ‘touch’—customer service—whether through the exceptional automated digital framework or (especially) person-to-person. We all have our war stories. The challenge for retailers is to guarantee that those skirmishes don’t grow into full-scale battles. That is, a mediocre implementation of a new business model that leaves customers wanting, ultimately ruins—not builds—the future of the retailer. Omni-channel is a concept to design better processes for customer fulfillment. Never lose sight of that goal.